Sinningia tubers are underground storage organs. They have most of the properties of stems, and are therefore identified as modified stems rather than roots. That being said, tubers don't look much like stems to a layman. A picture of the cross section of a Sinningia lineata tuber shows no internal structure, like "growth rings" or a ring of vessels, that we expect of a stem. 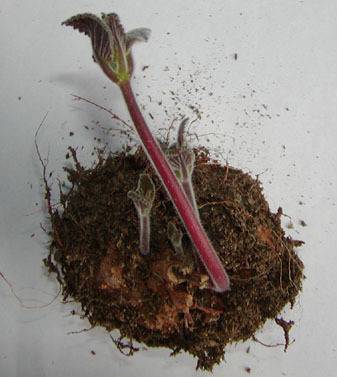 Shoots usually emerge from the center top of the tuber. This picture of a Sinningia douglasii tuber shows that is not always the case: none of the shoots are from the center of the tuber, and one of them is from way out on the flank. Compare that to a different tuber of the same species, where new shoots are sprouting from a central clump of stumps from previous years' stems. In a different pattern, a picture of a Sinningia cooperi tuber shows buds scattered over much of the upper surface. Species tulips, daffodils, and hyacinths make bulbs because in their native habitats (mostly central Asia and Mediterranean Europe), summers feature a lot of heat and not much rain. The fact that a location is plant-friendly four or six or eight months a year does not mean that it will be plant-friendly the year around. 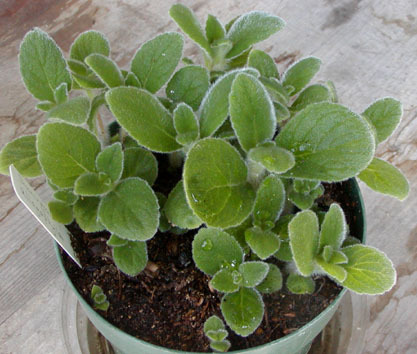 This has forced plants to develop strategies for coping with inhospitable seasons in otherwise hospitable climates. Being an annual is one of the most successful strategies. Annuals spend the cruel season as seeds, waiting for the return of kindly weather. The toughest annual seeds can wait years, if need be, for the right time to germinate. Other plants, such as tulips, survive the hard times by hibernating like bears. Annuals are restricted in size to as much as they can grow in a single season. Tulips can spend several growing seasons to reach blooming size, but an annual has to do it in one year. Hibernating perennials also have opportunities for vegetative propagation, as anyone who has naturalized daffodils will know (and appreciate). As the hospitable period of the year gets shorter, both the annual and hibernation strategies get less inviting. The good times come and go too fast. Some plants have adapted to short growing seasons by slow-growth strategies. In arid climates, cacti and other succulents sacrifice rapid growth for armor against the intensity of sunlight. In arctic climates, plants sacrifice rapid growth for armor against the bitter cold. All of these strategies have a price. They all require that resources be diverted from normal growth and reproduction and predator deterrence. This means that when we encounter one of these strategies, we must ask ourselves what otherwise inhospitable conditions are making these costly strategies profitable. So why do sinningias make tubers? The most obvious explanation is to survive a dry season. This might well be correct for the "meadow sinningias" like S. curtiflora, S. tubiflora, S. elatior, and S. allagophylla. They grow in places with lots of heat and little rainfall during the summer months. Drought might also be a factor in the case of species like S. nordestina, which are dormant throughout spring and the first half of summer, and grow in latitudes where it never gets really cold. Even so, it's hard not to notice that most sinningias in cultivation aren't dormant in the summer and autumn, the way tulips and daffodils are. They are dormant in winter. So what are they escaping? If not the summer heat, then the winter... what? Cold? Rain? Rats? Lack of pollinators? One thing is highly likely: it would cost more to try to keep growing in winter than it would to go dormant. Otherwise, sinningias would not go dormant. This picture illustrates one possible benefit. In March 2007, these plants of Sinningia allagophylla had sprouted with the advent of warm weather. In April 2007, however, there was not a speck of green to be seen. The sprouts had either disintegrated or been eaten down the the soil line. There were no telltale signs of caterpillar or snail predation, so I suspected the songbirds, ordinarily my friends, but in nesting time unpredictable consumers of plant material. Without much hope, I put the pot underneath a wire basket to keep out the avian rascals. The picture at the right shows the five-inch pot at the end of May 2007. A tuber not only provides a hibernation den during nasty weather, it also provides a fuel tank for coming back from adversity. 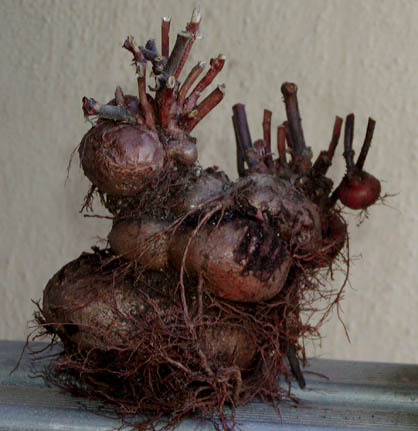 The tuber in this picture certainly has a fairy-castle quality. There are parapets and towers and crenelations and even a suspended chamber. If we looked closely, we'd probably find a catapult, or Rumpelstiltzchen. This tuber is about 15-20 years old, from a selfing of S. 'Peninsula Belle' (Sinningia reitzii x lineata). S. reitzii has a tendency toward multi-lobed tubers, which is where this plant must have gotten its architectural fantasy.